I was on Facebook earlier and on the right hand side there was a status I had written a year ago today. 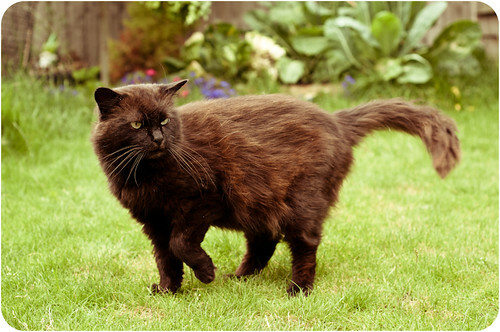 It said ‘There’s a black floofy cat in the garden!’ That cat was Oscar but at the time we had only seen him out and about and he was very scared. When we opened the door he ran off out of the garden. We had no idea then that he would become part of the family. It’s nice to be reminded of the progress we have made with him. He’s currently fast asleep on one of his favourite blankets. Here’s a photo that Daz took of him a few weeks ago, he’s such a handsome boy! Hope you re having an awesome day Beth! my bf’s family adopted a kitty, Mr. Boots, who looked just like Oscar. what a cutie!